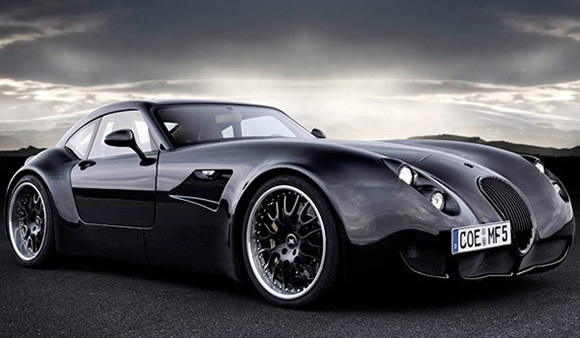 This is a Weismann GT MF-5. It has been described as "The perfect Roadster" by European Car Maagazine and talked about as the sportscar the Brits should have built by many others. Of course it's German and because it is the MF-5 handles perfectly and goes like a cut cat. I love this car. It embodies the idea of 'beautiful motoring' perfectly and with Wiesmann producing only 350 cars per year it keeps them rarer and more exclusive than a Lamborghini. Powered by BMW's mighty 5.0 litre V10 the 1,380kg car has 507hp on tap. Excellent! Top speed is 193mph and you get to 60mph in just under 4 seconds but it's the corners where this will come into it's own. And that is where it would be so much fun. Plus imagine pulling up next to or passing a Porsche or Ferrari in it. Magic. Beautiful car. Here's a google image search for you so you can drool over more great pictures.